Fall is in the air! Crisp days, and cool clear, low humidity nights are becoming the norm. Not to mention long nights, of course. 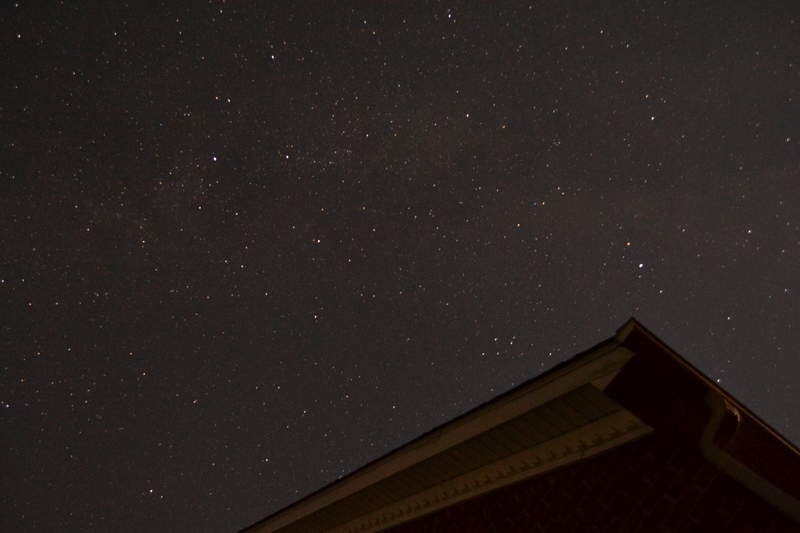 Cygnus is top center, with the Milky Way cutting through. Little Delphinus the Dolphin is the diamond and tail just above the roof, right of center. For now, the Summer Triangle is still high overhead after sunset, and the Lonely Star of autumn (Fomalhaut) is rising. The Milky Way is still putting on a show, for a while yet, and while Jupiter is all but gone, there’s about a month of Saturn viewing left. Just for fun, I set up the camera for a short (15 minute) time lapse of the Milky Way straight overhead – the Summer Triangle is at the top of the frame, and Cassiopeia is rolling into frame in the lower left. Each frame is a 30-second exposure, if you’re curious. The “event” to watch this week is in the early morning. A couple weeks ago, Mercury and Mars were in alignment, while Venus observed from the sidelines. As Venus and Mercury zip around behind the sun, though, the relative movement has been pretty dramatic. This week, Venus will approach and overtake Mars. Their closest approach will be Thursday morning (Oct 5), where they’ll be so close that you’ll need binoculars or a small telescope to pick Mars out of the glare of Venus. This is as close to a direct alignment (short of occultation or eclipse) as it gets – and of course, your eye is part of this alignment. Venus, Mars, and Earth all in a line… Syzygy! The still shows Monday morning’s view (Oct 2) – but watch over the course of the week, and it will be clear that these are planets! I’ve embedded a short movie here stitching together screenshots from Stellarium. Each day shows the eastern horizon at 6:30am for 8 consecutive days, beginning on Monday, Oct. 2. Monday morning has a bonus from the Mid-Atlantic. If you’ve got a fairly low view of the southern and eastern horizons, look toward Orion and Canis Major in the pre-dawn south. The Hubble Space Telescope will be tracking south-to-east on Monday morning, tracking towards the planets. At about 6:28, the HST will be just below the triangle that makes up Canis Major’s back leg, and directly below Sirius. Movement will be obvious if you can see low enough in the sky to pick it out. HST will be directly below Sirius at about 6:28EDT on Monday, Oct 2. Look low, and south. I’m really curious to know the geographical co-ordinates to best view these stellar activities. For the planetary alignments, it’s not that critical (it might be for an occultation, but some of that is specific timing). You should be able to see Venus/Mars slide past each other before dawn almost anywhere – the exact positions might be slightly different then what I’ve shown, as dawn at my house is 12 hours different from dawn in Asia, and that’s plenty of time for Venus to move. But in a grand sense, you can see the effect globally. I’ll look up the links you’ve mentioned. Great post. You have an awesome view of the Milky Way! Thanks. As you’ve mentioned it appears I have a darker sky. I’ve thought it would be interesting some night with big high pressure system and no clouds to get everybody to try and take the same picture with the same settings and compare.